Evolution through natural selection is intensely competitive, yet altruistic cooperation is remarkably common. It is found in social insects, human society, and even cells of multicellular organisms. Why individuals cooperate is one of the central puzzles of evolutionary theory. Here we describe advances in understanding the evolution of cooperation. Cooperation is the foundation of human society, animal herds, flocks and other social groups of animals. Only through cooperation can evolution construct structures of higher order . This includes even living cells whose components must work together to maintain the cell's functions and which themselves must cooperate to form multi-cellular organisms, which again can form groups, societies or states. Cooperation permeates so many aspects of our daily life and our environment that it is important to understand the mechanisms that lead to the evolution of cooperation. The evolution of cooperation has been a puzzle for evolutionary theorists since Darwin. The traditional understanding of natural selection is that evolution appears to be about competition. Yet this simple model of evolution by natural selection, in which the key element is the maximization of the individual's reproductive output, does not account for individuals that give up part of their reproductive potential in order to cooperate with others. For example, in gray wolves only the dominant male and female reproduce while all pack members cooperate to feed the group . Our understanding of evolution has been developed by using models, mathematical or computational descriptions of evolutionary processes in various levels of abstraction or detail. Based on early work by Ronald Fisher  and J.B.S. Haldane , William D. Hamilton formalized a model [5-6] that allowed traits to be selected that do not necessarily cause an individual to maximize its own number of offspring, but could instead cause it to help a closely related individual at the expense of its own reproductive potential. This process is called "kin selection," a term coined by J. Maynard Smith . Hamilton's model quickly became an ubiquitous tool for evolutionary biologists. It is based on the gene-centered view of evolution, explained in Richard Dawkins’s book, The Selfish Gene . According to this approach, under some conditions, when an individual helps close kin reproduce, because they have a large number of genes in common, more copies of a gene may be made than by selfish behavior. However, NECSI research has shown that the gene-centered view is based on a mean-field approximation. One assumes in mean-field approximation that each part of a system – in this case a particular gene of an individual – experiences the same conditions, also called "context." In traditional evolutionary models, this context is often simply the proportion of different types of individuals, or different gene combinations. Hence, these models describe evolutionary population dynamics as changes in gene frequencies from one generation to the next in the population as a whole. 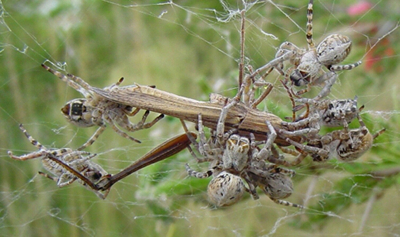 Individuals of the social spider Stegodyphus dumicola(Eresidae) feeding on a grasshopper. The kin selection modeling approach cannot explain cooperation between non-related individuals, let alone cooperation between different species, yet both play a key role in ecosystems . NECSI researchers have found that when organisms are distributed across their habitat and interact only with others nearby, altruism and cooperation readily arise that are not primarily based on relatedness but on the fact that individuals share the same local environment . The model, studied by Erik Rauch, Justin Werfel and Yaneer Bar-Yam [10-13], examined the evolution of reproductive restraint and showed that selfish individuals introduced to an altruistic population always ended up being driven to extinction. This is surprising, given the expectation that selfish individuals win. The key element of this new model is how a population can spread over an area. The researchers showed that the ability to spread only locally leads exploiters to overexploit the resources and cause their own extinction in that local area. Under the same conditions, the altruists survived by limiting their population growth to match the locally available resources. This leads to the altruists winning the evolutionary competition, and the species surviving. Symbiosis of goby and shrimp: The goby acts as a guard for the shrimp, which maintains their common burrow. In a scenario in which individuals can use social communication to send to and receive signals from others nearby that their local environment is crowded, individuals reliably come to use the signaling to restrict their reproduction when needed. With this action, individuals can also increase their overall reproduction rate as they are able to reduce their reproduction when necessary under crowded conditions. Therefore, when an individual with the capacity for communication is introduced to a noncommunicating population, it is much more likely to become the common ancestor of the entire population than is a noncommunicating individual. According to Werfel, "What is intriguing is that organisms in this model learn to signal each other when the resources are depleted, then they reduce their reproduction to avoid extinction. The ability to signal and communicate the need to change behavior in the face of low resources is a property of many organisms, even single celled organisms signal each other chemically to change their reproduction. The paper published in PNAS has model organisms that do exactly that. They signal each other when resources become depleted, reduce their reproduction when they receive the signal, and when resources increase, they increase their reproduction." 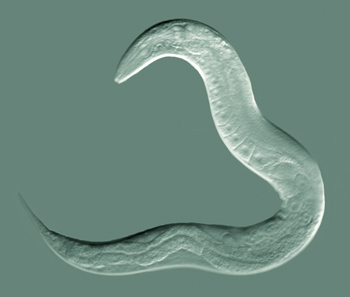 Caenorhabditis elegans uses pheromones to signal deteriorating environmental conditions such as crowding caused by a large increase of the population. M. A. Nowak, Five rules for the evolution of cooperation. Science 314, 1560-1563 (2006). T. Dewey, "Canis lupus". Animal Diversity Web. University of Michigan Museum of Zoology (2002). Accessed June 2, 2010. R. A. Fisher, The Genetical Theory of Natural Selection (Clarendon, Oxford, 1930). J. B. S. Haldane, Population genetics. New Biology 18, 34–51 (1955). W. D. Hamilton, The evolution of altruistic behavior. American Naturalist 97, 354–356 (1963). W. D. Hamilton, The genetical evolution of social behavior. Journal of Theoretical Biology 7 (1), 1–52 (1964). J. Maynard Smith, Group selection and kin selection. Nature 201 (4924), 1145–1147 (1964). R. Dawkins, The Selfish Gene (Oxford University Press, Oxford, 1976). D. H. Boucher, S. James, K. H. Keeler, The ecology of mutualism. Ann. Rev. Ecol. System 13, 315-330 (1982). J. Werfel, Y. Bar-Yam, The evolution of reproductive restraint through social communication. PNAS 101, 11019 - 11024 (2004). C. Goodnight, E. Rauch, H. Sayama, M. A. M. de Aguiar, M. Baranger, Y. Bar-Yam, Evolution in spatial predator-prey models and the "prudent predator": The inadequacy of steady-state organism fitness and the concept of individual and group selection. Complexity 13 (5), 23-44 (2008). E. Rauch, H. Sayama, Y. Bar-Yam, Dynamics and genealogy of strains in spatially extended host pathogen models. J Theor Biol 221, 655-664 (2003).